Do you enjoy cartoons? (even as an adult?) Do you sit and watch with your kids? Or, maybe you are the one without kids who watches, then quotes the movies back to your co-workers with kids (yeah, I’m the latter.) Well, either way, I highly recommend getting out to watch Gnomio and Juliet. Fantastic. Just fantastic. I think I laughed more than the kid next to me did. Here, check out this trailer before you go any further in my post. As always, the animations were amazing. So this movie, instead of drooling over the animations and ways they sketched, then rendered the characters, I put on my owl ears and spent my time trying to pick out the people behind the characters (cast & crew). Also, I couldn’t help but notice all the awesome sound effect details. Cast + sound effects + advantageous additions of Elton John music = one rockin’ & hilarious flick! Finally, I must point out the man behind Featherstone. I fell in love with this character. I giggled and anticipated every moment he’d come back on the screen. Thanks to his hilarious work as the Cuban flamingo, Featherstone, in Gnomio and Julie, I discovered that Jim Cummings is also the voice is behind my hero, Darkwing Duck. He has 350 acting roles to his name. WOW! Much of the Disney stuff, like Winnie the Pooh, has been done by him too. Wow, to think that one guy has been the voice behind many of the childhood cartoons I grew up with just blows me away. In addition to all these amazing voices and voice acting skills, were these wild sound effects. Seriously, how cute was it that the gnomes clinked when they try to kiss? They did a really good job in keeping with the theme and staying in-character with regards to sound effects. That really was, as my former automotive comrades used to say, a “surprise and delight” feature of the movie. I’d find myself laughing at a scene in the movie, then think, “oh my goodness, did everyone else hear the clink?” then I’d giggle like the Harajuku girl parody onPortlandia. Plus, there were all these times I’d be listening to the movie soundtrack and think, “Hey, wait, that’s a slow bit ditty of an Elton John song! Awesome!” Instant brand recognition. It helped me key into the feelings they were trying to evoke for the movie. A very cool touch, if I do say so myself. I highly recommend going to watch Gnomio and Juliet. Your kids will love it, and if you like goofy, silly fun or Shakespeare, it’s a win for everyone! Fiber festivals and market places are *the* best places to find your favorite online and indie retailers. 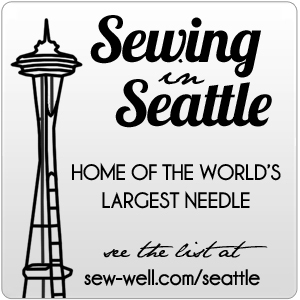 At the same time that Madrona is happening in Tacoma, WA, down in Santa Clara, CA Stitches West is going on. This morning I got a marketing email from Jennifer Hansen of Stitch Diva. What a creative and dedicated business woman she is! Well, she too understands the power of knowing her target market and using key pieces of technology and social media to reach that market. In her email was a link to a video she shot at Stitches recently. I just LOVE this interview and how cute the woman is talking about this blanket buster. By videoing this woman with her permission, she’s basically saying, “Gee thanks you’re so cool and what you said about my product is so amazing that I want to share it with others.” Take note of how she giggles with joy that this customer finds working with her product a spiritual like experience. Feeling & expressing that emotion will come across to your viewers if you are genuine. Shows people that she enjoys her own product and the results it brings to others. Now, I ask you, “How can you use this to better reach your target market?” It’s worth a good Winnie the Pooh think!